Rating: Mind blowing, but a hefty blow below the money-belt. 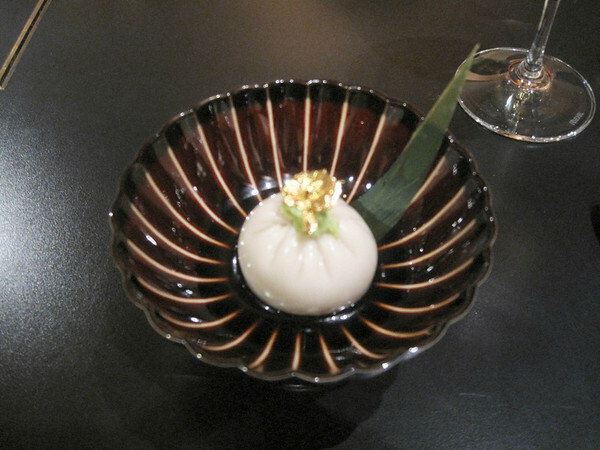 I’ve been here four or five times over the years, both in it’s older incarnation as Ginza Sushi-Ko under the supervision of chef Masa Takayama and in recent years when helmed by his disciple Hiroyuki Urasawa. To tell the truth, given my limited sampling, I think the student has surpassed the teacher. This is no strip mall sushi joint, but a deliberate effort to maximize the impact of flavor and presentation to the nth degree. This includes an almost gratuitous use of exotic and luxurious ingredients — not to mention gold foil. 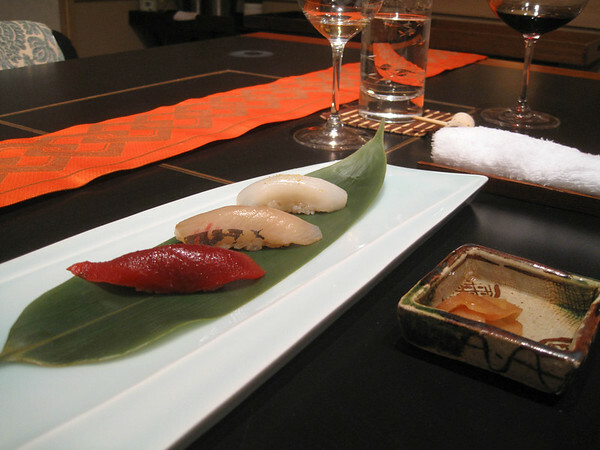 There are no menus here, no choices, just an expensive parade of delectables the chef selects. 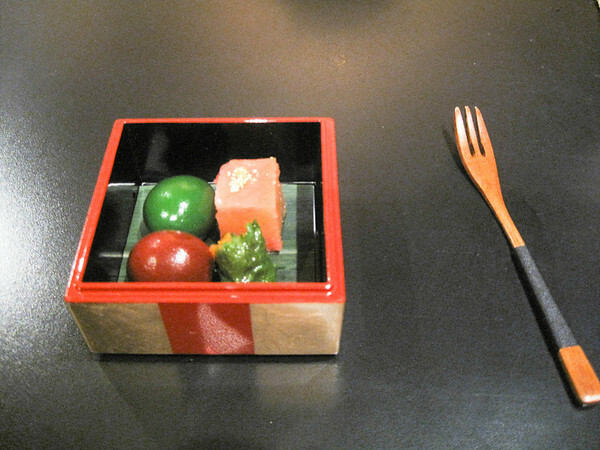 The place is tiny, only about 8 sushi bar seats and two little private rooms (one table each). This time we had a room as there were five of us celebrating a birthday. It’s been a little while so forgive me if I miss-remember some ingredients. 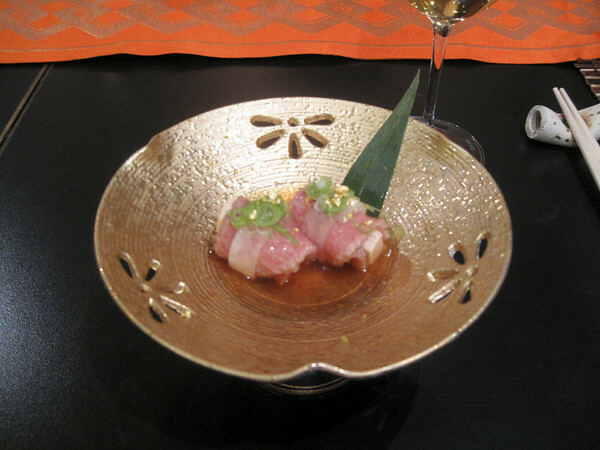 We start with some Toro (ultra rich tuna belly) wrapping a special kind of tofu, banded by daikon, topped with scallions and the omnipresent gold fold, and dosed with ponzu. Yum. Notice the shabby presentation. I can’t even remember what this was. But it had gold foil too. Sashimi. Look at this presentation. Ice has been carved into a form of sculpture. Flowers and little rocks adorn. The fish was melt in your mouth. Caviar with a few other bits on the spoon. Might have been Uni. Everything was delicious here, although if you’re some kind of land-lubber, stay home, pretty much 95% seafood. Gold foil again. 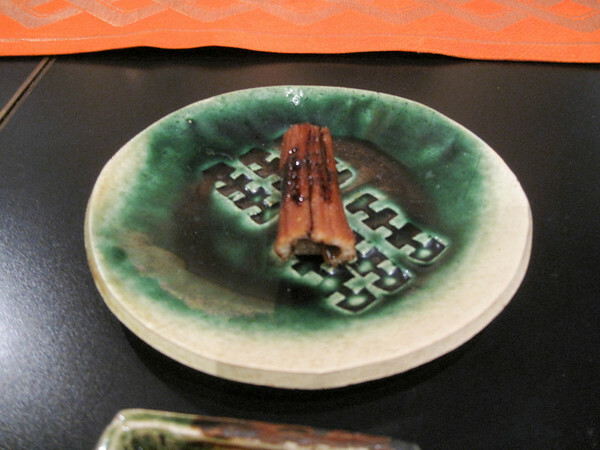 This dish had that kind of subtle Unami flavor profile that is unique to asian cuisines. I happen to love this kind of salty/savory flavor. I think there was a traditional egg custard underneath. 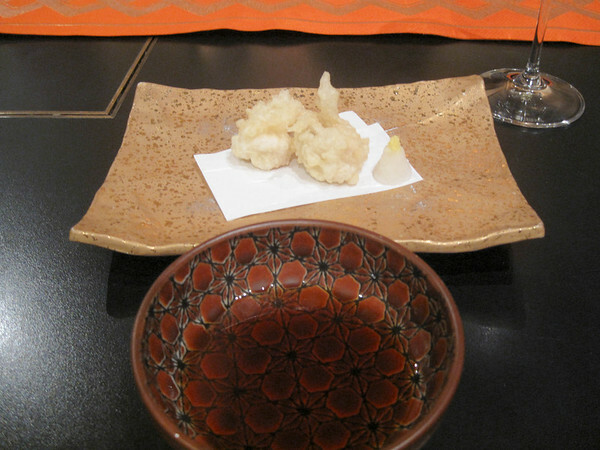 Tempura, very traditional style with the little mound of Daikon radish one can add. I can’t remember what was fried up, but I’m sure it was something rich like lobster. 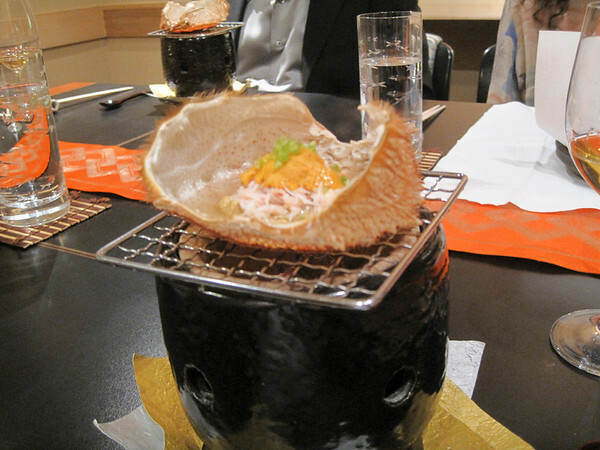 Or it might even have been Fugu (blow fish). I bet this spider crab didn’t think its body would end up being the cooking pot for its own meat. 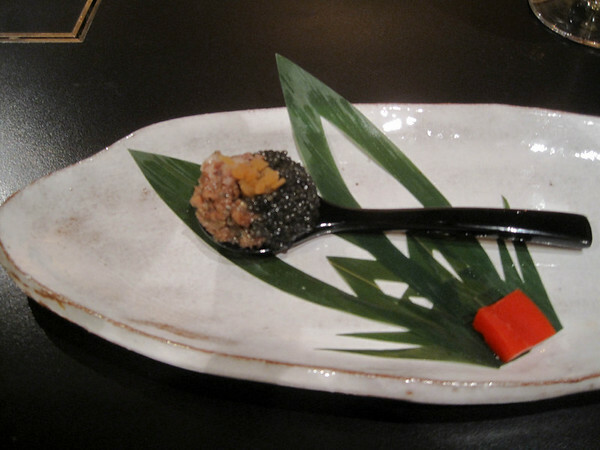 But it did, with a little Uni (Sea Urchin) to add some extra zest. Again very subtle flavors, and very juicy crab. This was sort of the ultimate shabu-shabu. 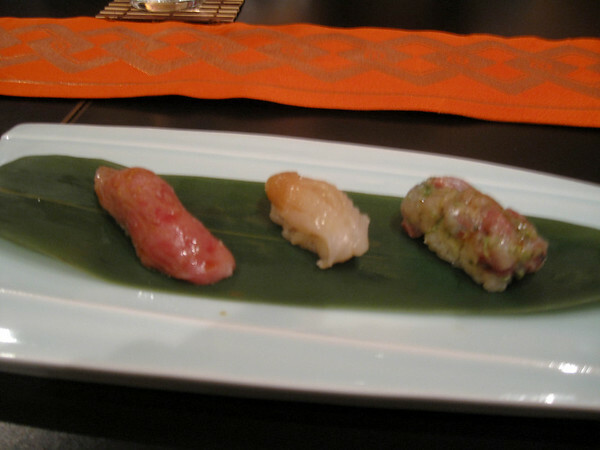 Below is a peice of kobe beef, some Akimo (Monfish liver), some japanese scallop and something else I can’t remember. 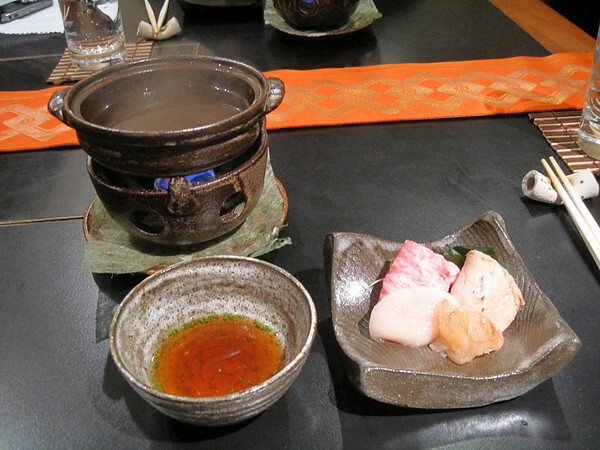 They are cooked in the heated broth in the upper left (very briefly, by swish swishing them — that is what shabu-shabu means), and then dipped in the tangy ponzu. 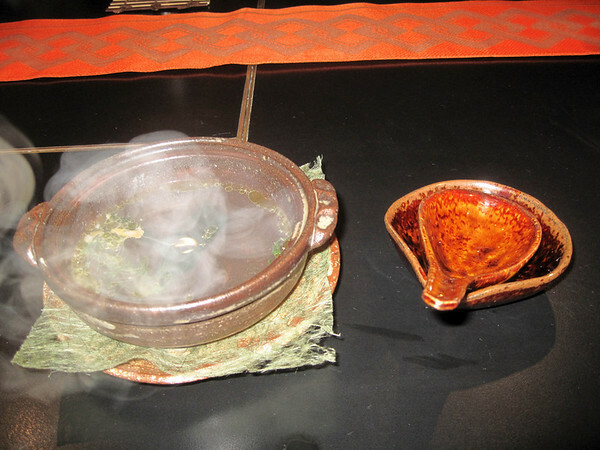 The resulting broth, rich from the fats of the beef and liver you drink as a soup. 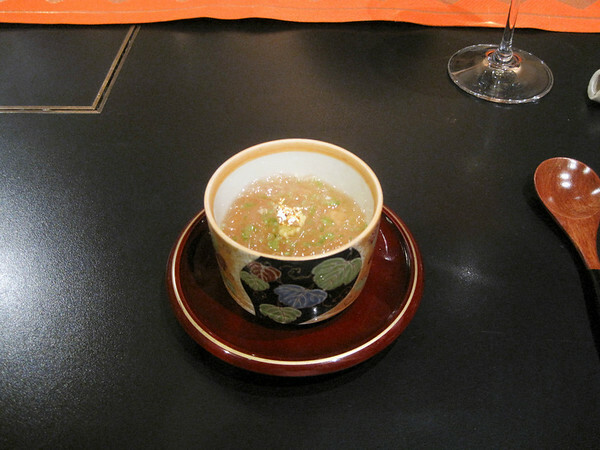 I think this is the above broth after it was served to eat. Some of the sushi got eaten before I got my camera aimed. The sushi here is incredibly good. Even the ginger is all hand made. 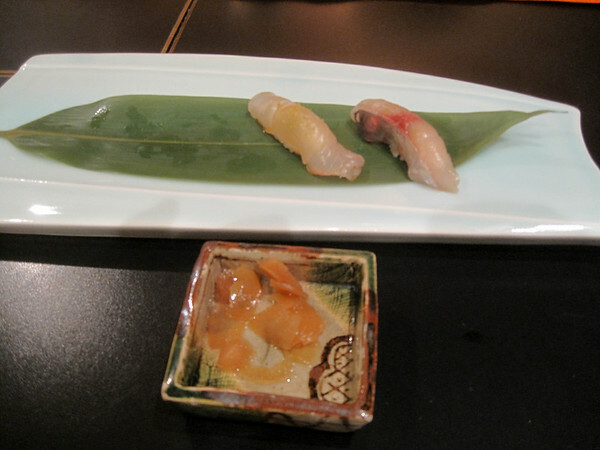 More sushi, classics such as Maguro, Hamachi, and Ika (squid), but spectacularly tasty. More sushi. I think you can technically keep on getting it as long as you have room (for the same high high price), but one fills quickly. 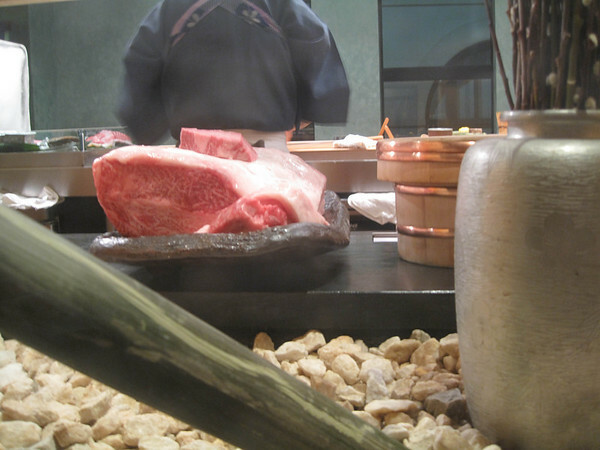 This is the big slab of Kobe beef that is the source of the bits we were eating. 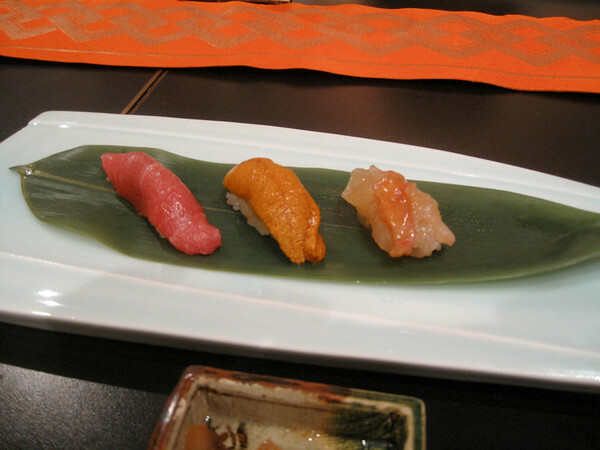 Toro, Uni, and some kind of clam. 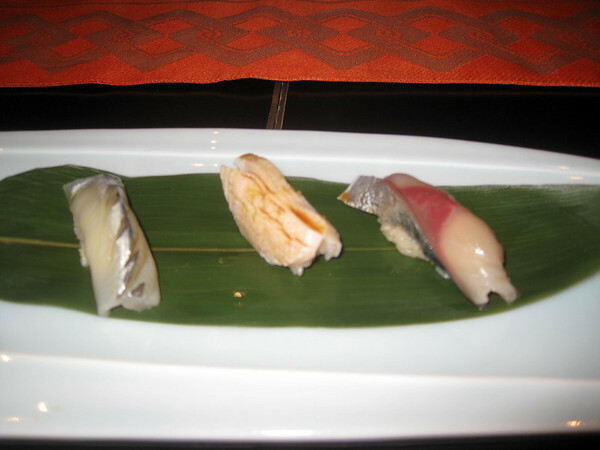 Three different grades of Toro. A rare treat. I think a mackerel, or maybe more than one type, and some thing else. I of course, being a dedicated gourmand (i.e. glutton) kept on letting them bring me more and more rounds. 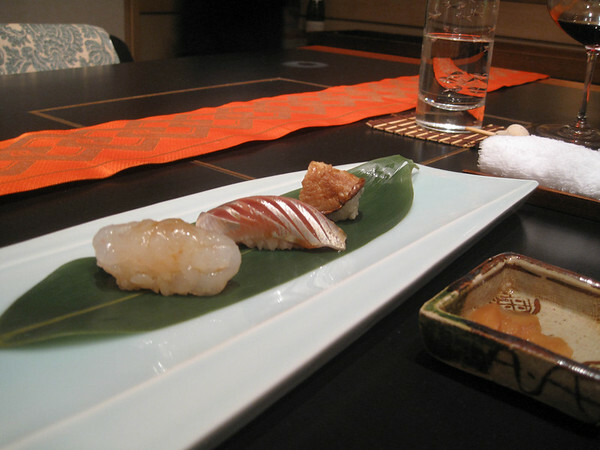 The very best sort of grilled sea eel. 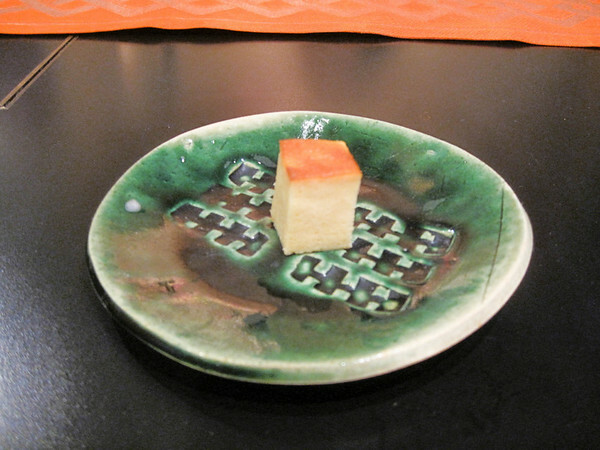 It is traditional to judge a sushi chef by the quality of his Tomago, or sweet omelet. Urwasawa passed muster. A refreshing course of various plums and pressed fruit things. Much more sour than American taste would normally allow. 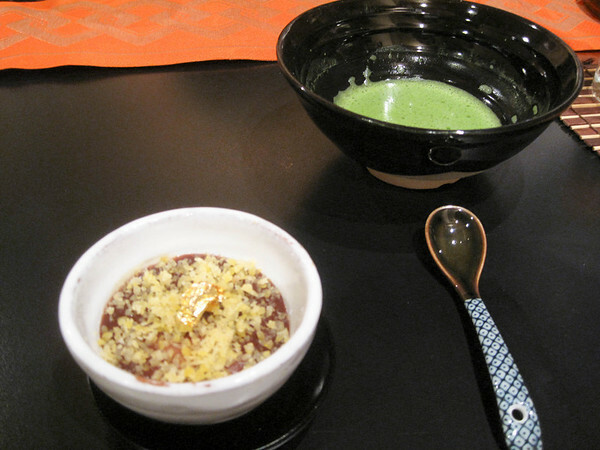 Red bean paste — which I’m not normally a fan of, but this one was great. Not pasty, but smooth with a nice crunch from the topping, not only the signature gold foil, but crumbled nuts of some sort, adding a pleasant richness. This was accompanied by very special green tea, frothed to a foamy consistency, but with a nice bitterness. 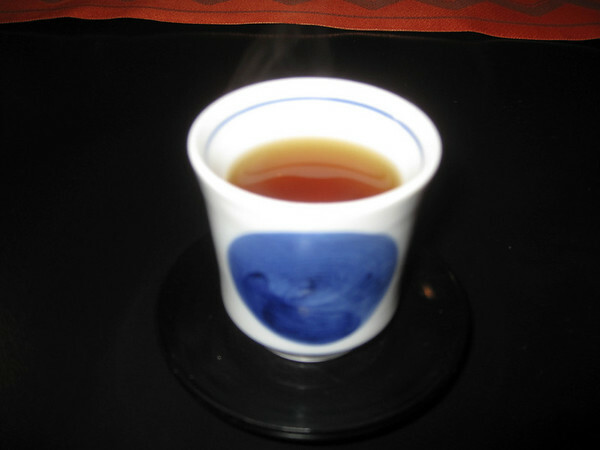 And then a VERY high end “tea ceremony” brown tea. 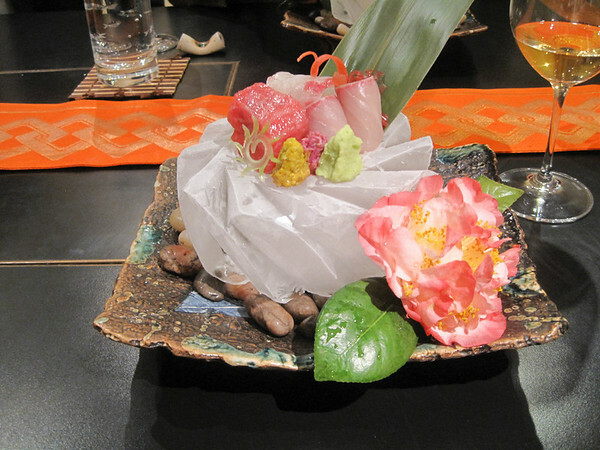 The overall meal was exquisite, blending fully food, ambiance and style. I forgot to photo my wine but I brought a number of high end whites including my last bottle of the 1986 Chateau Y, which is the almost dry secret wine of Château d’Yquem. 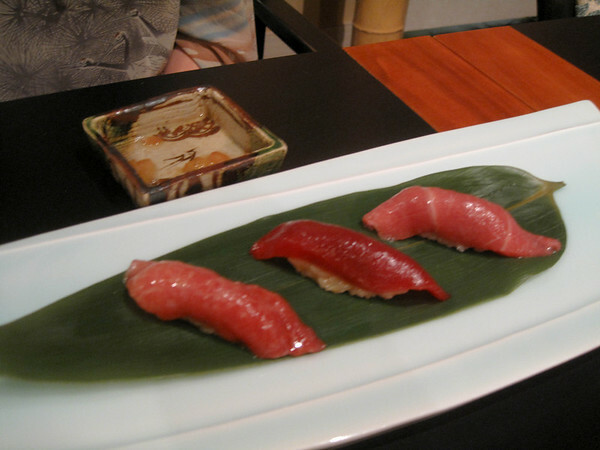 This entry was posted in Food and tagged Food, Hamachi, Japanese cuisine, Japanese Food, Masa Takayama, Restaurant, reviews, Sashimi, Sea urchin, Shabu-shabu, Sushi.